Tamil actor Dhanush's new movie song 'why this kolaveri di' is on the way to break youtube records. The promo of the song was released on youtube on November 16 and it is spreading like virus. On Thursday 24 November evening itself, the song got 3,020,014 hits in youtube and crossed 12,375,365 hits till now. 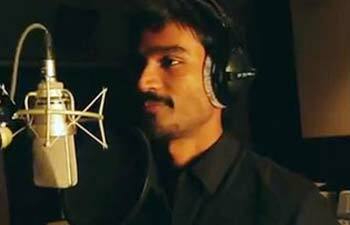 'Kolaveri di', sung by Dhanush in his new movie '3' directed by his wife Aishwarya, daughter of super star Rajnikanth has become the new anthem of youths. The music of the film '3', including this song, has been composed by 21-year old Anirudh Ravichander, Rajnikanth's nephew. Amitabh Bachchan, so impressed with 'kolaveri di' tweets on 25 November: This Kolaveri is veri veri endearing .. just not leaving the sound waves in the mind-u .. what-a what-a what-a do-u ... !! ha ha !! Junior Bachchan on 'kolaveri di' : how cool is Kolaveri di!!! slamming it LOUD! well done Dhanush and Aishwarya. big up guys! 0 Response to "Dhanush's 'Why this Kolaveri di' breaks records"